Alzheimer’s disease, a neurodegenerative disorder, is characterized by progressive cognitive impairment associated with the disruption of cholinergic neurotransmission. The aim of the present study was to evaluate the effect of α- or β-amyrin, a type of pentacyclic triterpene, on the cognitive impairment induced by scopolamine, a muscarinic acetylcholine receptor antagonist. To measure the abilities of various types of learning and memory, we conducted step-through passive avoidance task. 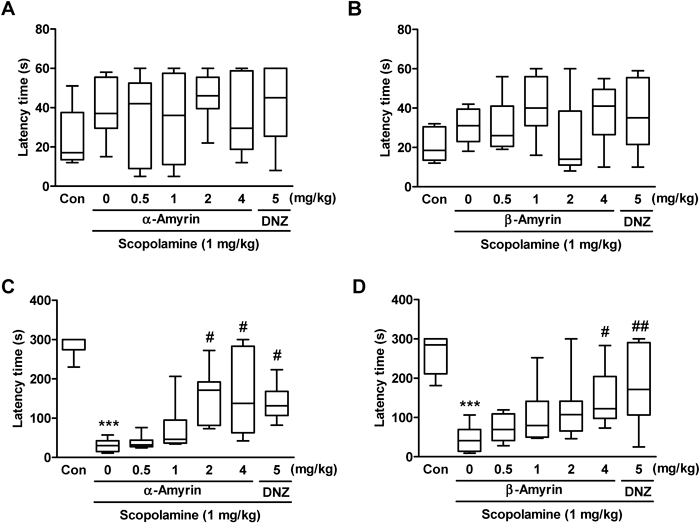 Scopolamine induced deficits in learning and memory processes in mice, which were antagonized by a single administration of α-amyrin (2 or 4 mg/kg) or β-amyrin (4 mg/kg), respectively. Additionally, in vitro analysis revealed that acetylcholinesterase activity was inhibited by β-amyrin, but not by α-amyrin. Furthermore, Western blot analysis revealed that the expression levels of phosphorylated extracellular signal-regulated kinase 1/2 (pERK) and phosphorylated glycogen synthase kinase-3β (pGSK-3β) were significantly enhanced by a single administration of α- and β-amyrin in the hippocampus. Finally, the memory ameliorating effects of α- or β-amyrin on the scopolamine-induced cognitive impairments were significantly blocked by ERK inhibitor U0126. The present study suggests that α- and β-amyrin may ameliorate the cognitive impairment induced by hypocholinergic neurotransmission via the activation of ERK as well as GSK-3β signaling. Many researchers want to develop a new entity compound or active extract from herbal materials for the treatment of AD.5) We previously reported that the ethanolic extract of Angelica keiskei markedly ameliorated scopolamine-induced memory impairments via the inhibition of AChE activity as well as through the activation of cAMP response element-binding protein (CREB)–brain-derived neurotrophic factor (BDNF) signaling.6) Using activity-guided fractionation to identify the active compound(s), we isolated the active compounds α- and β-amyrin from the ethanolic extract of A. keiskei. Amyrin is a plant-derived pentacyclic triterpene and is present as either α-amyrin (vicinal methyls in the E ring) or β-amyrin (geminal methyls in the E ring) (Fig. 1). These triterpenes have been reported to exert anti-inflammatory properties in various animal models, including colitis, cystitis or pancreatitis.7–9) In the central nervous system, α- and β-amyrin have been reported to exhibit anti-nociceptive properties via the activation of cannabinoid receptors10,11) and to exhibit anti-anxiety or anti-depression properties through the modulation of the benzodiazepine site of the γ-aminobutyric acid type A (GABAA) receptor or noradrenergic receptor, respectively.12) However, it is unclear whether α- or β-amyrin attenuates cognitive impairments in mice. In the present study, we attempted to evaluate the effects of α- and β-amyrin on scopolamine-induced deficits in contextual long-term memory using a step-through passive avoidance task. Furthermore, we investigated the effects of α- and β-amyrin on AChE activity and the activity of memory-related signal transduction molecules such as extracellular signal-regulated kinase 1/2 (ERK) and glycogen synthase kinase-3β (GSK-3β) in the hippocampus. All experiments with mice were performed according to the protocols approved by the Institutional Animal Care and Use Committee of Kyung Hee University (KHP-2013-01-06). Male ICR mice (5 weeks old; 23–25 g body weight) were purchased from Orient Co., Ltd., a branch of Charles River Laboratories (Gyeonggi-do, Korea). After delivery, five mice were housed in each cage for an additional week, and these mice were provided with food and water ad libitum. The cages were kept in a room with a 12 h light/dark cycle (light on 07 : 30–19 : 30) at a constant temperature (23±2°C) and humidity (60±10%). Animal maintenance and treatment were carried out in accordance with the Animal Care and Use Guidelines issued by Kyung Hee University, Republic of Korea. α-Amyrin, β-amyrin, donepezil hydrochloride, U0126 monoethanolate, (−)-scopolamine hydrobromide, acetylcholinesterase from Electrophorus electricus and Tween 80 solution were purchased from Sigma Chemical Co. (St. Louis, MO, U.S.A.). Antibodies against ERK and GSK-3β were purchased from Santa Cruz Biotechnology, Inc. (Santa Cruz, CA, U.S.A.). Antibodies against phosphorylated ERK (pERK) at threonine 202/tyrosine 204 and phosphorylated GSK-3β (pGSK-3β) at serine 9 were purchased from Cell Signaling (Danvers, MA, U.S.A.). All other materials were of the highest grades available and were obtained from normal commercial sources. Donepezil and scopolamine were dissolved in 0.9% saline solution. α-Amyrin and β-amyrin were suspended in 10% Tween 80 solution. An analysis of acetylcholinesterase activity was performed using acetylthiocholine iodide as a synthetic substrate in a colorimetric assay, as described elsewhere.16) Acetylcholinesterase from Electrophorus electricus (electric eel) was used as the enzyme source for the assay. Each drug was initially dissolved in dimethyl sulfoxide and diluted to several concentrations immediately before use. An aliquot of diluted drug solution was then mixed with 640 µL of phosphate buffer (0.1 M, pH 8.0), 25 µL of buffered Ellman’s reagent (10 mM 5,5′-dithio-bis(2-nitrobenzoic acid), 15 mM sodium bicarbonate), and the enzyme source (100 µL); the mixture was then pre-incubated at room temperature for 10 min. Ten minutes after the addition of 5 µL of acetylthiocholine iodide solution (75 mM), the absorbance was measured at 410 nm using a UV spectrophotometer (OPTIZEN 2120UV, Mecasys Co., Ltd., Korea). The concentration of drug required to inhibit acetylcholinesterase activity by 50% (IC50) was calculated using an enzyme inhibition dose response curve. To exclude interference due to the pigment of α-amyrin, β-amyrin or donepezil, the same volume of solution containing the drugs, Ellman’s reagent, and the enzyme source without acetylthiocholine iodide solution was used as a blank. One hour after the administration of α- or β-amyrin with or without scopolamine, the mice were sacrificed by decapitation and the brain was immediately removed. Isolated hippocampal tissues were homogenized in ice-chilled Tris–HCl buffer (20 mM, pH 7.4) containing protease and phosphatase inhibitors. The tissue lysate was centrifuged at 12000 rpm at 4°C for 20 min. The supernatant was quantified by the Bradford method using Pierce bicinchoninic acid (BCA) protein assay kit (Thermo Scientific, PA, U.S.A.), and 15 µg of protein was subjected to sodium dodecyl sulfate-polyacrylamide gel electrophoresis (SDS-PAGE) (8% gel) under reducing conditions. Western blot analysis was conducted as described elsewhere.13) Proteins were transferred onto a polyvinylidene difluoride (PVDF) membrane in transfer buffer and further separated at 100 V for 2 h at 4°C. The membrane was incubated for 2 h with blocking solution (5% skim milk) at 4°C, followed by overnight incubation with a primary antibody (pERK, anti-rabbit, 1 : 3000; pGSK-3β, anti-rabbit, 1 : 3000; ERK, anti-rabbit, 1 : 3000; GSK-3β, anti-goat, 1 : 3000). The membrane was then washed twice with Tween 20/Tris-buffered saline (TTBS), incubated with a horseradish peroxidase-conjugated secondary antibody for 2 h at room temperature, washed three times with TTBS, and developed using an enhanced chemiluminescence (Amersham Life Science, Arlington Heights, IL, U.S.A.). The immunoblots were imaged using a bio-imaging program on a LAS-4000 mini imager (FUJIFILM Lifescience U.S.A., Stamford, CT, U.S.A.) and analyzed using Multi Gauge version 3.2 (FUJIFILM Holdings Corporation, Tokyo, Japan). The phosphorylation level of ERK or GSK-3β was determined by calculating the ratios of phosphorylated protein to total protein on the same membranes. These mean values were normalized to the ratios obtained from the control animals. In the cases of pERK and ERK, we quantified the total density of the two bands. Data were expressed as the means±S.E.M. One-way ANOVA followed by Tukey’s post hoc test was used in the case of parametric data. For the nonparametric data, Kruskal–Wallis type of ANOVA was used, and comparisons were done by Dunn’s post hoc test. The interactions among groups were analyzed by two-way ANOVA, followed by the Tukey’s post hoc test. The quantitative Western blot analysis was analyzed by one-way ANOVA, followed by the Tukey’s post hoc test. All statistical analyses were performed using Prism 5 (GraphPad, CA). Statistical significance was set at p<0.05. To evaluate the effects of α- or β-amyrin on the scopolamine-induced memory impairment, we performed the passive avoidance task which can assess contextual long-term memory. As shown in Fig. 2, one-way ANOVA analysis revealed that no difference was observed in the latency of the acquisition trial among the treated groups (α-amyrin, H6=6.393, p=0.380, Fig. 2A; β-amyrin, H6=11.50, p=0.074, Fig. 2B). In addition, one-way ANOVA revealed that no difference was observed in the electric foot shock score from between the α/β-amyrin alone-treated group and α/β-amyrin+scopolamine-treated group (Supplementary Figs. 1A, B). At 24 h after the acquisition trial, the retention trial was conducted. One-way ANOVA analysis indicated that significant group effects were observed in the latency of the retention trial (α-amyrin, H6=39.66, p<0.001, Fig. 2C; β-amyrin, H6=29.06, p<0.001, Fig. 2D). We observed that the latency time was significantly decreased by a single administration of scopolamine (1 mg/kg) when compared to the vehicle-treated control mice (p<0.001, Figs. 2C, D). 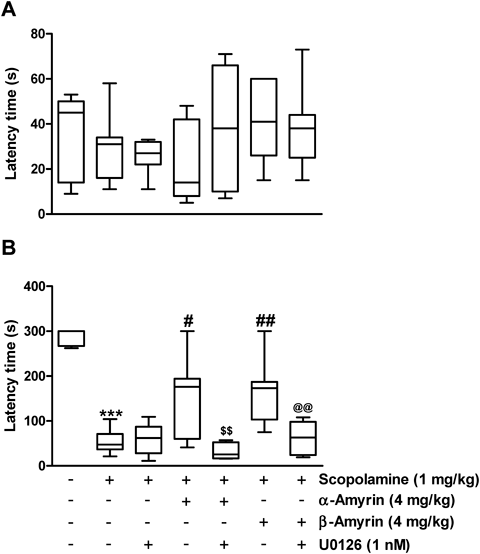 Furthermore, the reduced latency time induced by the administration of scopolamine was significantly increased by a single administration of α-amyrin (2 or 4 mg/kg) or β-amyrin (4 mg/kg) in a dose-dependent manner (p<0.05, Figs. 2C, D). Additionally, similar effects were observed following the administration of donepezil (5 mg/kg, per os (p.o. )), an acetylcholinesterase inhibitor that was used as a positive control. Amyrin (0.5, 1, 2 or 4 mg/kg, p.o. ), donepezil hydrochloride (DNZ, 5 mg/kg, p.o.) or the same volume of vehicle (0.9% saline solution) was administered 60 min before the acquisition trial. Memory impairment was induced by scopolamine (1 mg/kg, i.p.) 30 min before the acquisition trial. Twenty-four hours after the acquisition trial, a retention trial was conducted for 300 s. Results from the acquisition trial (A, B) and retention trial (C, D) are presented (n=8–9 per group). *** p<0.001 versus the vehicle-treated controls; #p<0.05; ##p<0.01 versus the scopolamine-treated group. Con, control. A previous study reported that scopolamine-induced memory impairments were ameliorated by the administration of the ethanolic extract of A. keiskei due to its inhibition of AChE.6) Therefore, we investigated whether the memory-ameliorating effects of α-amyrin and β-amyrin were also caused by the inhibition of AChE activity. In vitro data revealed that AChE activity was inhibited by β-amyrin (IC50: 164.7 µM) and donepezil (IC50: 0.028 µM), but not by α-amyrin (IC50>500 µM) (Fig. 3). AChE activities were measured using acetylthiocholine iodide as a synthetic substrate in a colorimetric assay. Each AChE activity was observed in three times. Fifty percent inhibitory concentrations of AChE activity represent means±S.E.M. Because the inhibitory activities of α- or β-amyrin on AChE were markedly lower than that of donepezil, we assumed that the memory-ameliorating effects of α- or β-amyrin may result from changes in cellular signal transduction. Thus, we investigated whether a single administration of α- or β-amyrin with scopolamine would affect the level of memory-related signal transduction molecules, such as ERK, Akt and GSK-3β in the hippocampal tissue. As a result, the expression level of pERK was significantly decreased by the administration of scopolamine, which was blocked by the administration of α- and β-amyrin (p<0.05, Fig. 4A). Furthermore, the expression level of pGSK-3β was also significantly increased by the administration of α- and β-amyrin as compared to the vehicle-treated or scopolamine-only treated group (p<0.05, Fig. 4B). However, the expression of ERK and GSK-3β were not changed by the administration of α- or β-amyrin (Fig. 4). α-Amyrin (4 mg/kg, p.o.) or β-amyrin (4 mg/kg, p.o.) was administered 30 min before scopolamine treatment (1 mg/kg, i.p.). The mice were sacrificed 30 min after the final administration. The control group was treated with the same volume of vehicle solution. The expression levels of pERK, ERK, pGSK-3β or GSK-3β in the hippocampal tissue and its quantitative analysis are represented. The densitometric analyses of the ratios of pERK/ERK and pGSK-3β/GSK-3β were normalized to the control group. Data represent the mean±S.E.M. (n=3–4 per group). * p<0.05 versus the indicated group. n.s., not significant. To clarify whether the memory ameliorating effects of α- or β-amyrin (4 mg/kg) on the scopolamine-induced cognitive impairments was associated with activation of ERK signaling, we conducted antagonism study using ERK inhibitor, U0126 (1 nM, intracerebroventriculasly (i.c.v.)). As shown in Fig. 5B, the memory ameliorating effects of α- and β-amyrin on the scopolamine-induced cognitive impairments were significantly reversed by U0126 (p<0.01). Moreover, two-way ANOVA analysis revealed that the interaction between α- or β-amyrin and U0126 treatments showed a significant group effect (α-amyrin, F1, 22=8.909, p<0.01; β-amyrin, F1, 23=8.834, p<0.01). In the acquisition trial, however, no significant differences in step-through latency were observed among the treated-groups (Fig. 5A). U0126 (1 nM in 3 µL) was intracerebroventricularly injected to the mice 60 min before the acquisition trial. α- or β-Amyrin (4 mg/kg, p.o.) or the same volume of vehicle (0.9% saline solution) was administered 60 min before the acquisition trial. To induce cognitive impairments, scopolamine was administered 30 min before the acquisition trial. Twenty-four hours after the acquisition trial, a retention trial was conducted for 300 s. Results from the acquisition trial (A) and retention trial (C) are presented (n=6–7 per group). *** p<0.001 vs. vehicle-treated controls, #p<0.05, ##p<0.01 vs. scopolamine only-treated group, $$p<0.01 vs. scopolamine+α-amyrin-treated group, @@p<0.01 vs. scopolamine+β-amyrin-treated group. Numerous studies suggest that acetylcholine and its muscarinic receptor play important roles in learning and memory processes in multiple neural systems, including hippocampus. For example, activation of a muscarinic receptor by acetylcholine facilitates the induction of synaptic plasticity, such as long-term potentiation (LTP) in the hippocampus and enhances cognitive function.17) On the other hand, systemic treatment with or an intrahippocampal injection of muscarinic antagonist impair learning and memory behavioral tasks in healthy animals and non-diseased humans.18,19) As with the cholinergic hypothesis of AD, it has been suggested that the blockade of muscarinic receptors by scopolamine induces changes in electroencephalographic as well as cognitive performance, such as working memory impairments, which are relevant to the characteristics of AD.20) Furthermore, scopolamine-induced cognitive impairment is reversed by AChE inhibitors in animals, which is known to improve cognitive function in AD.21) Consistent with other studies, we observed that the acute administration of scopolamine impaired fear-based contextual long-term memory in the passive avoidance test.22) Furthermore, the scopolamine-induced memory impairments were reversed by the single administration of α- and β-amyrin. These results indicate that α- or β-amyrin can be candidate agents for treating the dementia observed in AD. We previously reported that the ethanolic extract of A. keiskei could inhibit the activity of AChE, which may lead to improve cognitive function.6) Therefore, we investigated whether α- or β-amyrin inhibited AChE activity in vitro. In the present study, we found that only β-amyrin, but not α-amyrin, exhibited weak inhibitory properties against AChE when compared to donepezil. A similar study showed that kalopanaxsaponins A and B, types of triterpenoid saponins that have similar structures to β-amyrin (geminal methyls in the E ring), also inhibited AChE activity and improved memory function in the scopolamine-induced amnesic model.23) Therefore, we assume that the different effects of α-amyrin and β-amyrin on AChE may result from these distinct structures. Moreover, the memory-ameliorating effects of α-amyrin on scopolamine-induced memory impairments may be not resulted from its AChE inhibitory activity. Several studies have suggested that ERK, a subfamily of mitogen-activated protein kinases, is required for the establishment of LTP, a cellular mechanism thought to underlie neuronal plasticity as well as the development of several forms of memory.24,25) In neuron, the activation of muscarinic acetylcholine receptors (mAChRs) is known to induce the elevation of intracellular calcium level, phosphoinositol turnover and the activation of several kinases such as protein kinase C (PKC), phosphoinositide-3 kinase (PI3K) and ERK.26–28) In the present study, we showed that the administration of α- or β-amyrin increased the phosphorylation of ERK in the hippocampus, whereas phosphorylation level of PKC or PI3K was not changed (data not shown). Moreover, the memory-ameliorating effects of α- or β-amyrin were blocked by ERK inhibitor U0126. Since multiple signal transduction pathways can be involved in ERK activation, it is still unclear that the effects of α- or β-amyrin on ERK activation are mediated via mAChR. However, our results showed the possibility that both α- and β-amyrin can rescue memory impairments through ERK phosphorylation, in part. On the other hand, recent studies have revealed that GSK-3β could be directly involved in synaptic plasticity and memory processes. For example, GSK-3β is required for the induction of N-methyl-D-aspartate (NMDA)-dependent long-term depression (LTD) as well as NMDA-dependent LTP in the hippocampus.29) Furthermore, it was reported that lithium, a GSK-3β inhibitor, attenuated scopolamine-induced memory impairments via the inhibition of GSK-3β.30) GSK-3 inhibitors are focused to be therapeutic target for the therapeutic intervention in neurodegenerative diseases including AD.31) In addition, the inhibition of GSK-3β activity by phosphorylation at serine 9 is known to be regulated by various kinases such as Akt (protein kinase B) as well as ERK through the activation of p90RSK.32,33) In the present study, the phosphorylation levels of GSK-3β were increased in the hippocampus by the administration of α- and β-amyrin. However, we found that the activity of Akt (protein kinase B), which is known as a master regulator of GSK-3β activity, was not changed in response to α- and β-amyrin treatment (data not shown). 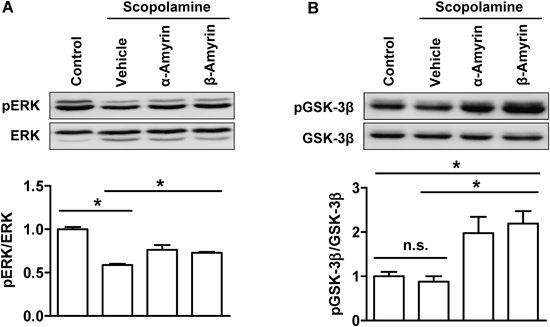 Although it remains unclear whether the administration of α- and β-amyrin may directly regulate the phosphorylation of ERK or GSK-3β, we assume that the inhibition of GSK-3β activity by α- and β-amyrin may result from the activation of ERK signaling, which may contribute to the memory improvement. In conclusion, the present study suggests that the single administration of both α- and β-amyrin ameliorates scopolamine-induced cognitive impairments in mice. 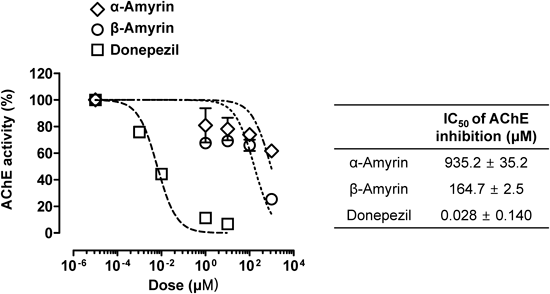 In vitro data reveal that β-amyrin, but not α-amyrin, weakly inhibits AChE activity. Furthermore, the memory-ameliorating effects of α- or β-amyrin may result from the activation of ERK as well as from the inhibition of GSK-3β in the hippocampus. Thus, these results indicate that α- or β-amyrin may be a candidate agent for treating the cognitive dysfunction that is induced by disturbances in the cholinergic neurotransmitter system, such as those observed in AD. This research was supported by the Basic Science Research Program through the National Research Foundation of Korea (NRF) and was funded by the Ministry of Education, Science and Technology (2012R1A2A2A02012332). 1) Ballard C, Gauthier S, Corbett A, Brayne C, Aarsland D, Jones E. Alzheimer’s disease. Lancet, 377, 1019–1031 (2011). 2) Terry AV Jr, Buccafusco JJ. The cholinergic hypothesis of age and Alzheimer’s disease-related cognitive deficits: recent challenges and their implications for novel drug development. J. Pharmacol. Exp. Ther., 306, 821–827 (2003). 3) Parsons CG, Danysz W, Dekundy A, Pulte I. Memantine and cholinesterase inhibitors: complementary mechanisms in the treatment of Alzheimer’s disease. Neurotox. Res., 24, 358–369 (2013). 4) Tayeb HO, Yang HD, Price BH, Tarazi FI. Pharmacotherapies for Alzheimer’s disease: beyond cholinesterase inhibitors. Pharmacol. Ther., 134, 8–25 (2012). 5) Kim HG, Oh MS. Herbal medicines for the prevention and treatment of Alzheimer’s disease. Curr. Pharm. Des., 18, 57–75 (2012). 6) Oh SR, Kim SJ, Kim DH, Ryu JH, Ahn EM, Jung JW. Angelica keiskei ameliorates scopolamine-induced memory impairments in mice. Biol. Pharm. Bull., 36, 82–88 (2013). 7) Lima-Júnior RC, Sousa DI, Brito GA, Cunha GM, Chaves MH, Rao VS, Santos FA. Modulation of acute visceral nociception and bladder inflammation by plant triterpene, α-, β-amyrin in a mouse model of cystitis: role of tachykinin NK(1)-receptors, and K(+)(ATP) channels. Inflamm. Res., 56, 487–494 (2007). 8) Matos I, Bento AF, Marcon R, Claudino RF, Calixto JB. Preventive and therapeutic oral administration of the pentacyclic triterpene α,β-amyrin ameliorates dextran sulfate sodium-induced colitis in mice: the relevance of cannabinoid system. Mol. Immunol., 54, 482–492 (2013). 9) Melo CM, Morais TC, Tome AR, Brito GA, Chaves MH, Rao VS, Santos FA. Anti-inflammatory effect of α,β-amyrin, a triterpene from Protium heptaphyllum, on cerulein-induced acute pancreatitis in mice. Inflamm. Res., 60, 673–681 (2011). 10) Simão da Silva KAB, Paszcuk AF, Passos GF, Silva ES, Bento AF, Meotti FC, Calixto JB. Activation of cannabinoid receptors by the pentacyclic triterpene α,β-amyrin inhibits inflammatory and neuropathic persistent pain in mice. Pain, 152, 1872–1887 (2011). 11) Otuki MF, Ferreira J, Lima FV, Meyre-Silva C, Malheiros A, Muller LA, Cani GS, Santos AR, Yunes RA, Calixto JB. Antinociceptive properties of mixture of α-amyrin and β-amyrin triterpenes: evidence for participation of protein kinase C and protein kinase A pathways. J. Pharmacol. Exp. Ther., 313, 310–318 (2005). 12) Aragão GF, Carneiro LM, Junior AP, Vieira LC, Bandeira PN, Lemos TL, Viana GS. A possible mechanism for anxiolytic and antidepressant effects of α- and β-amyrin from Protium heptaphyllum (AUBL.) March. Pharmacol. Biochem. Behav., 85, 827–834 (2006). 13) Lee HE, Lee SY, Kim JS, Park SJ, Kim JM, Lee YW, Jung JM, Kim DH, Shin BY, Jang DS, Kang SS, Ryu JH. Ethanolic extract of the seed of Zizyphus jujuba var. spinosa ameliorates cognitive impairment induced by cholinergic blockade in mice. Biomol. Ther. (Seoul), 21, 299–306 (2013). 14) Riekkinen P Jr. 5-HT1A and muscarinic acetylcholine receptors jointly regulate passive avoidance behavior. Eur. J. Pharmacol., 262, 77–90 (1994). 15) Kim DH, Kim S, Jeon SJ, Son KH, Lee S, Yoon BH, Cheong JH, Ko KH, Ryu JH. Tanshinone I enhances learning and memory, and ameliorates memory impairment in mice via the extracellular signal-regulated kinase signalling pathway. Br. J. Pharmacol., 158, 1131–1142 (2009). 16) Ellman GL, Courtney KD, Andres V Jr, Feather-Stone RM. A new and rapid colorimetric determination of acetylcholinesterase activity. Biochem. Pharmacol., 7, 88–95 (1961). 17) Buchanan KA, Petrovic MM, Chamberlain SE, Marrion NV, Mellor JR. Facilitation of long-term potentiation by muscarinic M(1) receptors is mediated by inhibition of SK channels. Neuron, 68, 948–963 (2010). 18) Soares JC, Oliveira MG, Ferreira TL. Inactivation of muscarinic receptors impairs place and response learning: implications for multiple memory systems. Neuropharmacology, 73, 320–326 (2013). 19) Bartus RT, Dean RL 3rd, Beer B, Lippa AS. The cholinergic hypothesis of geriatric memory dysfunction. Science, 217, 408–414 (1982). 20) Ebert U, Kirch W. Scopolamine model of dementia: electroencephalogram findings and cognitive performance. Eur. J. Clin. Invest., 28, 944–949 (1998). 21) Buccafusco JJ, Terry AV Jr, Webster SJ, Martin D, Hohnadel EJ, Bouchard KA, Warner SE. The scopolamine-reversal paradigm in rats and monkeys: the importance of computer-assisted operant-conditioning memory tasks for screening drug candidates. Psychopharmacology (Berl. ), 199, 481–494 (2008). 22) Uchida S, Endo S, Akita K, Ohta T, Fukuda S. The cyanine Dye NK-4 improves scopolamine-induced memory impairments in mice. Biol. Pharm. Bull., 35, 1831–1835 (2012). 23) Joh EH, Lee IA, Kim DH. Kalopanaxsaponins A and B isolated from Kalopanax pictus ameliorate memory deficits in mice. Phytother. Res., 26, 546–551 (2012). 24) Giovannini MG. The role of the extracellular signal-regulated kinase pathway in memory encoding. Rev. Neurosci., 17, 619–634 (2006). 25) Atkins CM, Selcher JC, Petraitis JJ, Trzaskos JM, Sweatt JD. The MAPK cascade is required for mammalian associative learning. Nat. Neurosci., 1, 602–609 (1998). 26) Bonner TI, Buckley NJ, Young AC, Brann MR. Identification of a family of muscarinic acetylcholine receptor genes. Science, 237, 527–532 (1987). 27) Felder CC. Muscarinic acetylcholine receptors: signal transduction through multiple effectors. FASEB J., 9, 619–625 (1995). 28) Rosenblum K, Futter M, Jones M, Hulme EC, Bliss TV. ERKI/II regulation by the muscarinic acetylcholine receptors in neurons. J. Neurosci., 20, 977–985 (2000). 29) Peineau S, Taghibiglou C, Bradley C, Wong TP, Liu L, Lu J, Lo E, Wu D, Saule E, Bouschet T, Matthews P, Isaac JT, Bortolotto ZA, Wang YT, Collingridge GL. LTP inhibits LTD in the hippocampus via regulation of GSK3β. Neuron, 53, 703–717 (2007). 30) Wu YY, Wang X, Tan L, Liu D, Liu XH, Wang Q, Wang JZ, Zhu LQ. Lithium attenuates scopolamine-induced memory deficits with inhibition of GSK-3β and preservation of postsynaptic components. J. Alzheimer’s Dis., 37, 515–527 (2013). 31) Cai Z, Zhao Y, Zhao B. Roles of glycogen synthase kinase 3 in Alzheimer’s disease. Curr. Alzheimer Res., 9, 864–879 (2012). 32) Medina M, Wandosell F. Deconstructing GSK-3: The fine regulation of its activity. Int. J. Alzheimer’s Dis., 2011, 479249 (2011). 33) Frödin M, Gammeltoft S. Role and regulation of 90 kDa ribosomal S6 kinase (RSK) in signal transduction. Mol. Cell. Endocrinol., 151, 65–77 (1999).